Are You Stuck on the High Dive of Life? Please allow me to introduce you to my new friend, Bev. 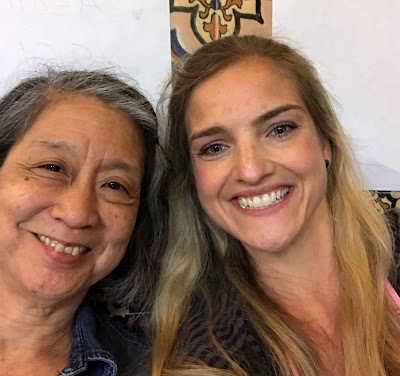 We met two weeks ago at Breathe For Change in San Fransisco, a mindfulness and yoga training programs designed especially for educators. In one of our first workshop sessions we discussed mindful listening, made partners, and shared with one another "what holds you back?" The picture she had journaled resonated with me, and I was captivated by the accompanying story. 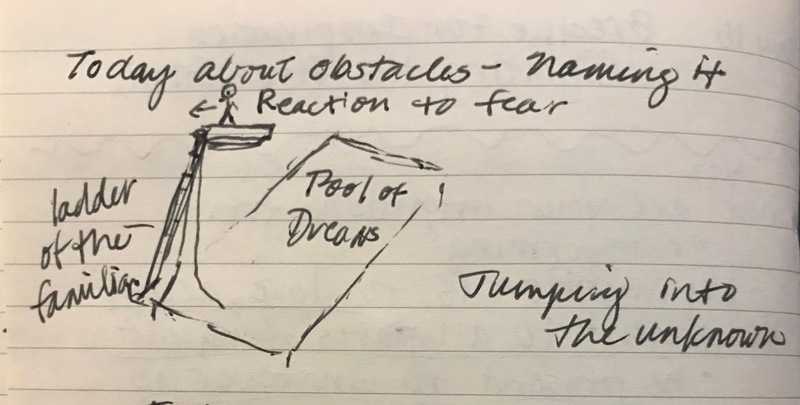 The ladder of the familiar, a "Pool of Dreams" and jumping in the unknown. When Bev was 8 years old, she took swimming lessons at the local YMCA. Even though a few decades have passed, she still vividly remembers the day she climbed the ladder to the high dive, became paralyzed with fear, and couldn't bring herself to jump. Later she found the courage, but not in that moment. Instead, she chose to descend the stairs back to the safety rather than facing the foreboding water. She realized that the pattern of rising to new heights with the support of family, friends and self-discipline can result in getting stuck on a high dive in life; our "pool of dreams" awaits below, but we would rather find our way back down to the comforting concrete of what we've grown accustomed to instead of finding ourselves in unknown waters. As she spoke, my heart sank like a diver gracefully plunging toward the bottom of that pool. I immediately felt a connection to her story, and her wisdom washed over me as I held back the tears welling in my eyes waiting to wash down my face. You see, the day before I flew across the country to Breathe for Change, I had just taken my dream job, a truly once-in-a-lifetime position- increased diversity, smaller classes, a wellness program, graduate school assistance, more instructional time- you name it. After a decade of teaching, I was finally prioritizing self-care and finding a better work/home balance. I was ready for a change. Practicing diver's pose with a beautiful group of teachers who are ready to change the world! Before accepting the job, I now realize I had become stuck on a diving board in my career. I whole-heartedly fought my way up the same professional ladder many teachers face: I kept long hours and struggled for resources, and in spite of obstacles my students exceeded. But, once I had gotten to the highest rung, there was nowhere else to go. Sure, the view was nice and safe, but when the possibility of a new position in a more supportive environment was made available to me, I knew I had to jump. If I didn't, I might find myself retreating with a descent of indifference, burn-out, and bitterness. The retreat to the comfort of the ground below is all too common with current teacher attrition rates in the United States. That would not be my destiny. I held my nose, closed my eyes and leaped the platform that had held me up, but also held me stagnant. Even though I am still in a mid-air free fall until school starts in August, I cannot wait to make a splash and explore my own pool of dreams in a school full of diversity and means for sustaining my continued growth as an educator. Breathe for Change has reawakened the awareness of keeping my growth a priority. Not only did I get my Yoga Alliance 200-hour certification and attain skills for maintaining mindfulness and social justice in my classroom, I made lifelong friends. Breathe for Change Community Circle Yoga Poses Session. It's amazing what you can do with support! Many conversations during the last 16 days, including the life-changing one with Bev, have helped me to more fully celebrate the diversity of others while giving me courage and a renewed hope for the future of education. Whatever diving board you find yourself on- whether it be the need to find a new teaching position, start graduate school, move into an administrative role, or beginning the journey of putting your needs first- I invite you to close your eyes and jump rather than withdraw back to the familiar. Who knows what awaits in your pool of dreams? Special thanks to the Svadhyaya sisters - my small mentorship group during the Breathe for Change training and it's leader, Robin (in front).